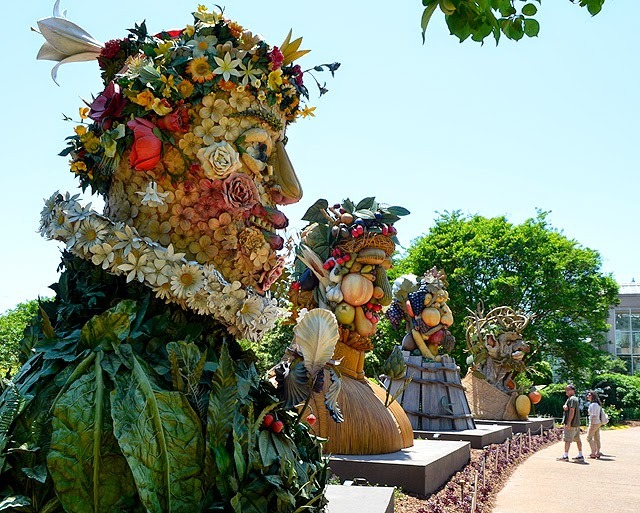 At more than 15-feet tall each, Four Seasons—by American artist Philip Haas, inspired by 16th Century Italian artist Giuseppe Arcimboldo—is now on display at the Atlanta Botanical Garden through October 2014. I think I've mentioned before that I was in quite a few art classes when I was in school, before college. It's pretty amazing how much art I've seen as an adult that I'd only before seen in text books, including Four Seasons. 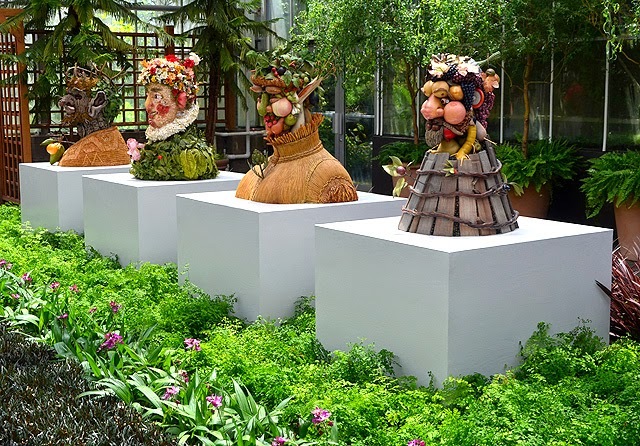 Well, not the sculptures that are currently on display at the Atlanta Botanical Garden, but the Four Seasons paintings by Giuseppe Arcimboldo. Even as a kid I found them amusing and fascinating. 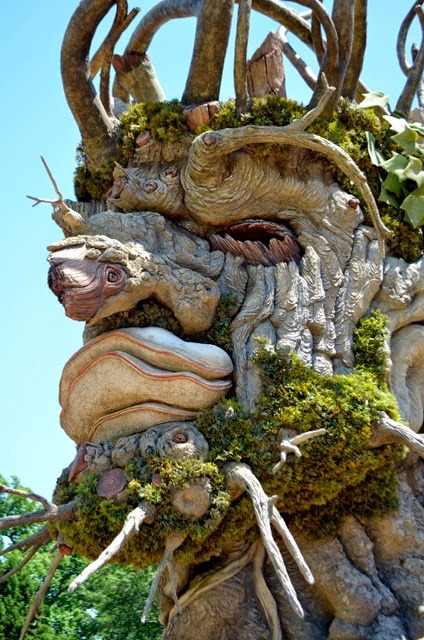 To now see Four Season, the 15-foot tall sculptures by Philip Haas, is wonderful. They're fantastic! You can see just how enormous they are in the photo above. I've heard many, many visitors say, "Winter is my favorite," over the three or four times I've seen them already. I like him a lot as well. This is the kind of exhibit where you appreciate all the pieces, but will very likely have a favorite...they're so much fun! Speaking of fun, I hope you enjoyed the humor in this post's title, "Atlanta Haas Four Seasons"...I thought it was quite clever. Given our relatively short and mild winters—if you don't count the two crippling snow storms earlier this year—we do have four distinct seasons in Atlanta, it just seems sometimes that spring and fall are just as short as our winters. I for one would rather have 90 degree weather than snow...I'm quite grateful for our short winters. I love the snow, I've even seen it snow in August when I lived in Wyoming, but being born in Florida, sunshine runs through my veins. I have a strong preference for warmer weather...one of the reason I moved back to Atlanta! These guys have traveled the world! Including New York, Milan, and the Gardens of Versailles. The sculptures are quite spectacular and I am glad to know that so many people have and are experiencing the joy of seeing these remarkable portrait sculptures. 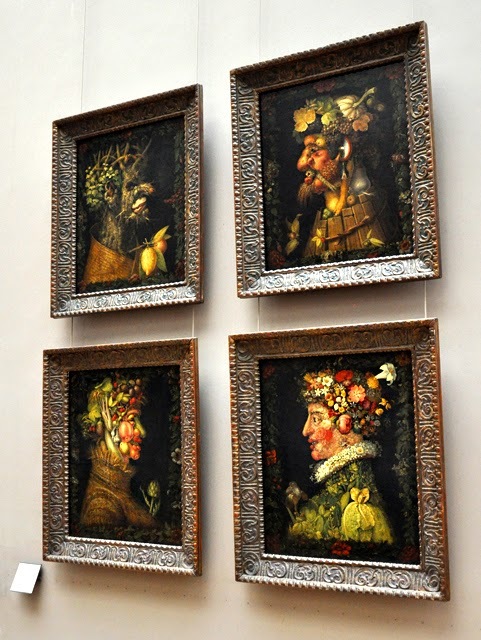 I went to the Garden recently with my best friend Barry who told me that he had seen the Arcimboldo paintings in the Louvre while on a Paris vacation (photo below)...the same ones that I'd seen in textbooks decades before! The photos of his vacation are phenomenal! And his recounting of the visit totally reinforced my having Paris at the top of my "places-to-visit" list. 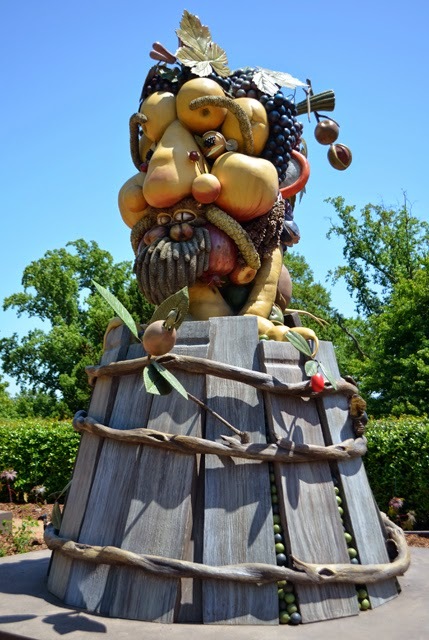 Coincidentally, while we were scanning Barry's Paris photos in search of the Arcimboldo paintings, we ran across Bosio's Hercules Fighting Achelous Transformed Into a Snake, which we'd just seen at the High Museum of Art in November! He'd seen it before it came to the High, so for me, having not yet traveled to Paris, it was cool to see it in its home setting. 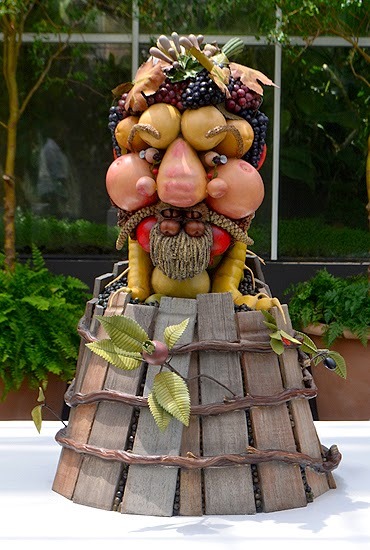 To totally appreciate Haas' 21st Century Four Seasons, it helps to know a little more about Giuseppe Arcimboldo's Renaissance Four Seasons. Giuseppe Arcimboldo was the son of a painter. I'd always assumed that Four Seasons were the only portraits of their kind, but it turns out that Arcimboldo did others. At the time of the paintings, he came under scrutiny of other artists...they didn't consider the paintings "art". They were too "amusing". 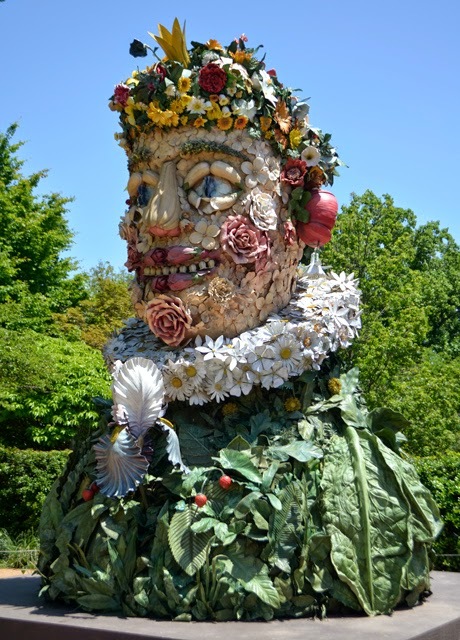 Fortunately for us, the paintings survived and Arcimboldo is to this day a revered artist. While the portrait sculptures are phenomenal, I find the bases as fascinating as the faces. Each is fantastic, but I think I like the autumn base most. Who doesn't like a glorious glass of good wine? I've been on a number of winery tours, around the world, but I've not yet been on a multi-vineyard wine tour in Georgia. I hear good things about Georgia Wine Tours...which is on my list of things-to-do. And I love that Winter features a humongous orange and lemon...it gives parents the opportunity to share with their kids that citrus is actually harvested in winter, even though we typically think of them as summer foods. Don't be afraid to get close so you can really explore the sculptures, without violating the discernible boundaries of the exhibit, of course. 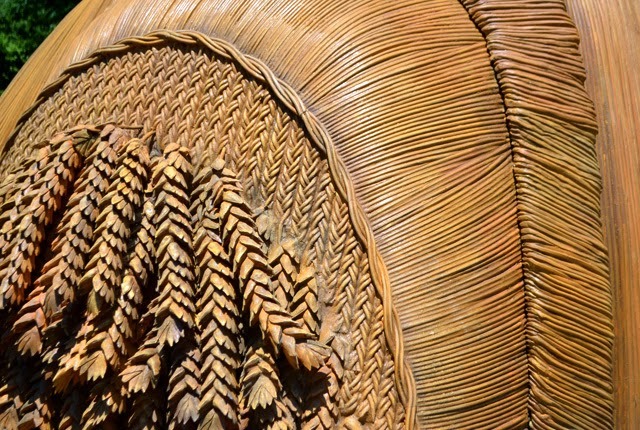 Notice the details of each sculpture. The details of these, to me, are reminiscent of a Salvador Dali painting...you can stare at it for hours and continually see something new. The original Arcimboldo Four Seasons paintings are all profiles, as you can see in Barry's photograph earlier in this post. However, there was enough detail—even though the paintings are hardly excessive in size—for Haas to extrapolate great detail for the monumental 3D portrait sculptures, with little liberty taken. There are small models of the sculptures (photo above) in the Fuqua Orchid Center. 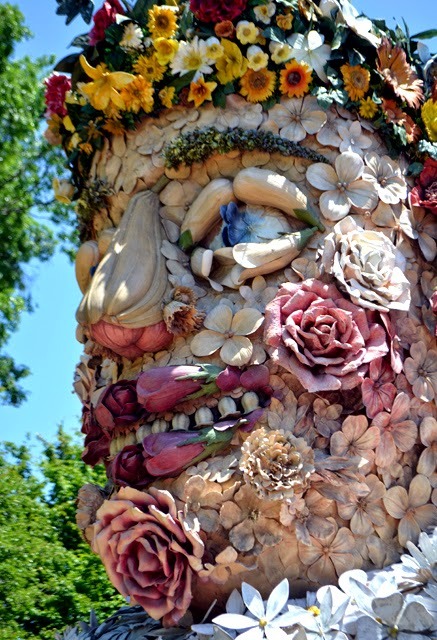 If you've not yet seen their 15-foot tall counterparts, they're an enticing prelude to the wonderment of the gigantic Haas sculptures. While you're in the Fuqua Orchid Center, be sure you visit all the display rooms and research areas. Even if you didn't pick up a map when you came in, you may not realize that there are distinct areas in the Orchid Center. There's the main 'exhibit' area immediately off the Fuqua Conservatory. Then there's the High Elevation Tropicals Display Room featuring plants and orchids that grow 6,000 to 10,000 feet. And the main display room features plants and orchids that grow below 6,000 feet. There's also the art gallery (hallway), a classroom, and an orchid research center and orchid library. There's a LOT in the Center, actually! 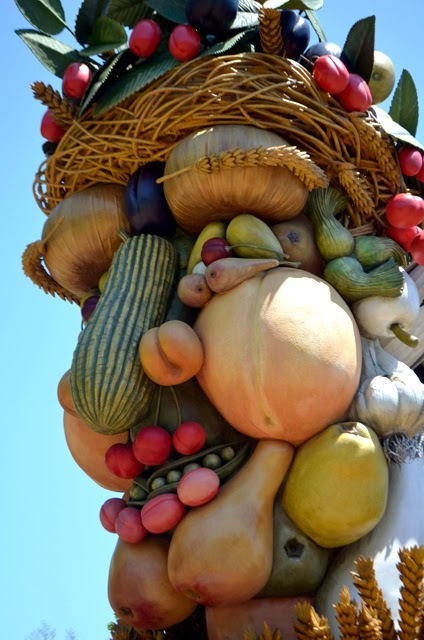 I was sharing with you earlier the illustrious career of Giuseppe Arcimboldo. Among his experiences, he was a court portraitist of Maximilian II in Prague. Look closely and you'll see an "M" in the base detail of Winter, believed to be an homage to Maximilian, who Arcimboldo worked for when the paintings were created. 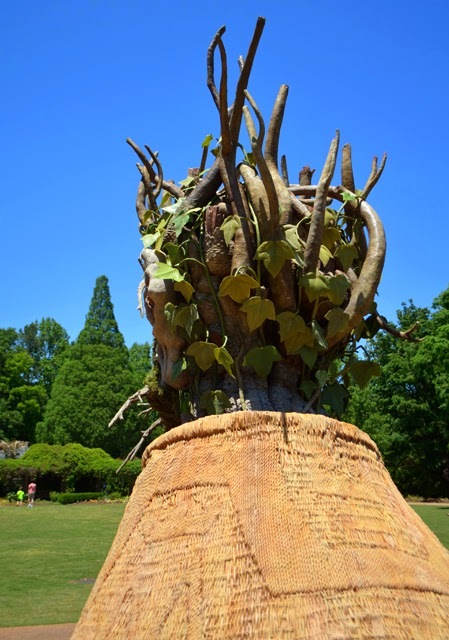 Four Seasons is on display at the Atlanta Botanical Garden now through October, in conjunction with Imaginary Worlds: A New Kingdom of Plant Giants. It's kind of cool that they're on display for three of the four seasons, but the Winter sculpture need not worry...it will get plenty of attention. The kids are going to love these colorful sculptures, or if you prefer an adult evening out, perhaps enjoy a Cocktails in the Garden 'date night'! And may I recommend that if you go in the evening, get there early so you can see them in daylight, Garden's dramatic lighting, and moonlight. Journey with Gentle Giants...Whale Sharks!